What app? How to make sense of all the apps out there to help with your indoor training this winter. The snow is falling, the ski resorts are open and you are thinking about how you are going to get ready for your next multistage race or endurance mountain bike race like High Cascades 100 that I decided to register for next summer. Or you just want to be fit for some great summer riding whether it be on the road or dirt. There are lots of options out there for you to train through the winter months. But first and foremost, if you have been racing cyclocross you first need to take a little bit of a break from the bike. Take 1-2 weeks completely off the bike, during that time focus on all the household chores and other family things you may have neglected if you were racing cyclocross this fall. Once you feel rested then it is time to think about training and your goals for next spring. So, let’s take a look at what’s out there to help you get quality training in during the winter months. Smart trainers: What is a smart trainer? A smart trainer is a trainer that when in erg mode, changes the resistance based on the input it is receiving from an app or other computer program. All you have to do is pedal and you will get in a great workout. This can be via Bluetooth or ANT+ technology, two different ways your smart trainer communicates with the app or computer program. I love the Wahoo Kickr as it has a real feel to it and I can use it with many apps to keep me from getting bored. There are many smart trainers on the market, both those you take the wheel off (like the Wahoo Kickr) and those you leave the wheel on (like the Wahoo Snap trainer). You can also use a regular fluid or wind trainer with a power meter, cadence or speed sensor that is bluetooth or ant + compatible as it will work with some of the apps. With this type of setup the resistance doesn't change automatically on the trainer but you change gears to simulate riding on the road. With this the apps are there for entertainment and to push you to get in a better workout then if you just pedaled on a trainer. Apps: The main apps I like are Zwift, Sufferfest and Trainer Road. There is also the Training Peaks Daily Workout app that can transfer any workout written in Training Peaks directly to your Garmin device (520, 820, 1000, or 1030 with most recent firmware) for you to follow while on your trainer. Another new app on the market is Rouvy. It is the old Cycle Ops virtual ride that looks to take in elements of Zwift with racing, training with videos like Sufferfest, and you can write your own workouts like Trainer Road. I have not tried it yet so can’t really comment. 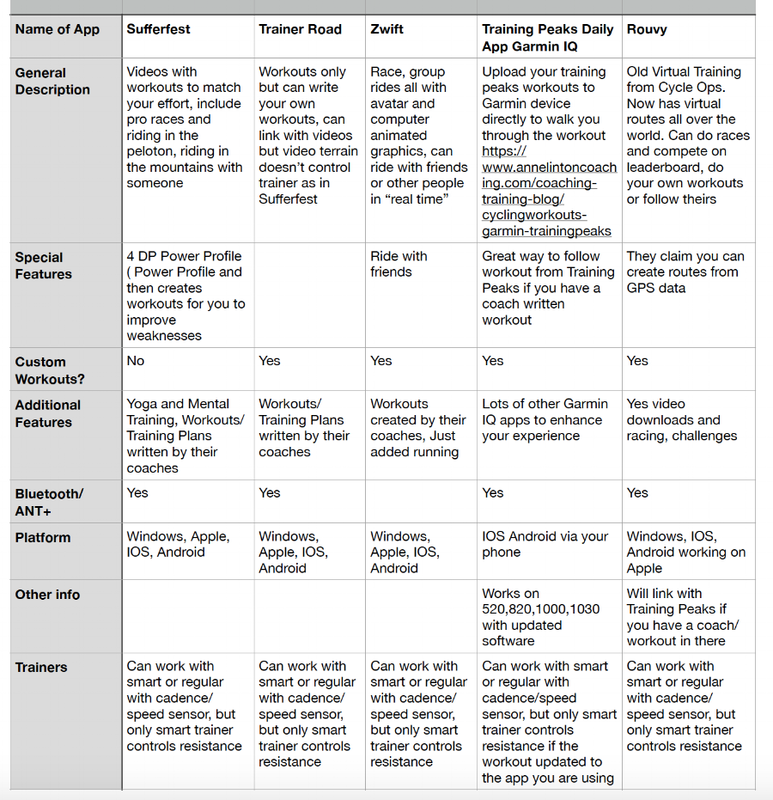 Here is a brief table of the different apps and what they offer. All of these apps charge around $10-$15 per month. These are a great way to keep things fresh and interesting when you have to turn to indoor rides and offer great interfaces for coaches and athletes. My favorite is probably Sufferfest as I Iove riding the various routes in the Dolomites where I can get a real feel of the terrain by the power needed to climb the hills. I also did their 4 DP Power test and although it was difficult I loved the fact I was doing the 20-min portion while chasing Peter Sagan in the winning move of the Tour of Flanders. Zwift is fun if you want to join a group ride or want to simulate a race against riders all around the world. I have also used Zwift to ride with a coaching client of mine who lives in Chicago while I am here in Bend which is pretty cool too. If you are a Bend local and want to check out the Wahoo Kickr or Garmin devices come over to Sunnyside Sports to check them out.